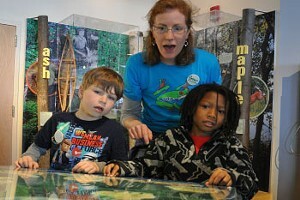 Halloween Decorations | Habitat | Kids VT - small people, big ideas! Ask anyone in the Underhill-Jericho area where to find the best Halloween decorations, and most will send you to the Stoners' house. 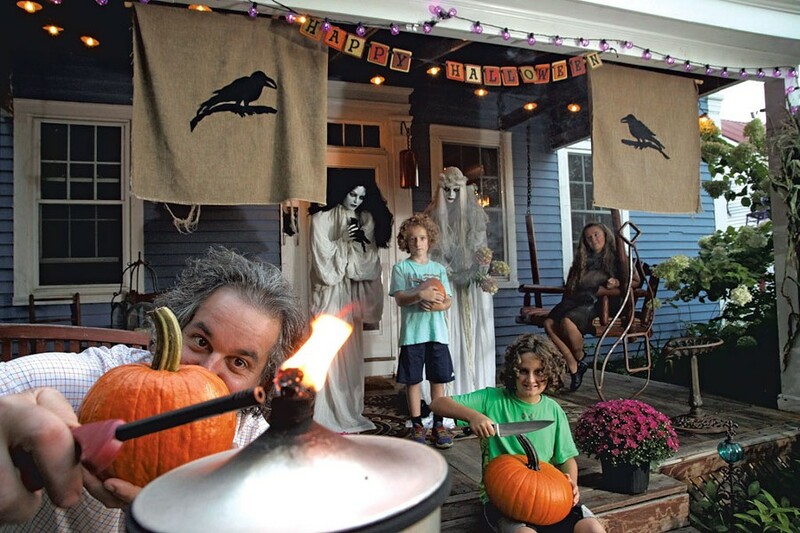 Gerry, Jackie and their sons, 10-year-old Rowan and 8-year-old Rory, create a spooky display in their front yard each year, starting in early October. Gerry is an art instructor and sculptor. His forged-iron sculptures of horses, fish and abstract shapes fill the family's backyard. So when October rolls around, a few pumpkins on the porch simply won't do. The mad decorating started when the boys were toddlers. Jackie and Gerry put a series of small, carved pumpkins above their front door. Since their house is located on a well traveled road, they received a lot of comments about how perfect the gourds looked against their old blue house. Since then, they have added at least one piece each year. 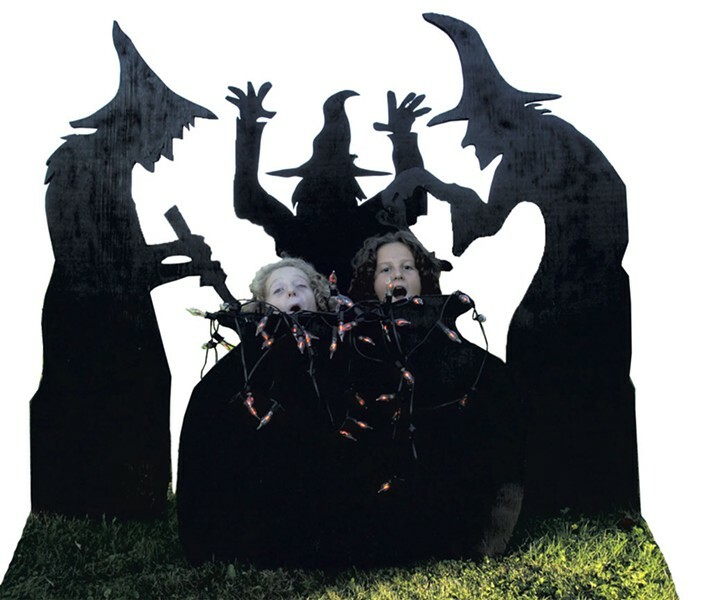 Most prominent are the life-size trio of wooden witches stirring a cauldron that the Stoners place in the middle of the front lawn. To make them, Jackie first drew them on paper, then cut out the drawing and used a projector to display the image on a large piece of three-quarter-inch plywood. She traced the witches on the wood, cut them out with a jigsaw and painted the entire piece black. The family runs an extension cord from the house to the cauldron, where orange lights are arranged to look as if they're spilling out of the pot. The piece is so big it has to be screwed into stakes that Gerry pounds into the lawn each year. Another life-size figure in a flowing white gown — Haunted Helsa — came from the home décor supplier Grandin Road. The Stoners also bought some plastic ravens, along with a skeleton on a bike walking a skeleton dog. For window dressings, Jackie sewed silhouettes of ravens on burlap, which she hangs over the windows facing the road. A large, homemade banner on the porch reads, "Happy Halloween," and purple lights and cornstalks adorn the stairs to the front door. What is it about the haunted holiday that the Stoners like so much? "There are no obligations in Halloween like there are on other holidays," says Gerry. "It is just fun with a capital F."
Kem Ziegerhofer, a stay-at-home mom to Calvin, 11, Elliott, 8, and Phoebe, 6, has thrown an over-the-top party at her Cambridge home on the Saturday closest to Halloween for the past several years. We asked her to share tips for families looking to plan an all-ages celebration of their own. Go for classic decorations that are spooky but not too scary, like spiders, cobwebs, string lights and lanterns. Simple and affordable decorations like "floating" ghouls, skeletons and silhouettes can be found in dollar stores or online. Pumpkins are a versatile decoration. Cover them in glitter, paint them, or carve holes in them and fill them with little toy mice peeking out. Use a mold to make a Jell-O "brain," then surround it with "dirt" (crumbled chocolate cookies) and "worms" (Jell-O set in bendy straws). A serve-yourself goody bag station with colorful candies and toys provides take-home treats and, if displayed artfully, acts as a decoration. A cauldron of chili can be made ahead of time and serves a crowd.